Sun Dogs is a map-and-text game, with various events tied to each location, and various routes between locations. Much of the pleasure comes from exploring and finding out how different this universe is from our own. So far it’s formally reminiscent of 80 Days, but that’s where the resemblance ends. Sun Dogs is austere, minimally directed, thinly populated rather than teeming with people and cultures. No other named characters appeared at all in the time I was playing, and even my own character is abstract, impersonal, and easily changed. When I started I was given a simple mission, and occasionally landing on a planet seemed to produce further outcomes, but in general I was just hopping from place to place, trying to wrap my mind around the world that the creators had built. The game is set in a transhumanist future in which we have changed both our solar system and our own bodies beyond recognition. All the planets through Mars are accessible, and there are additional stations and stopping points at some major asteroids, and in the “debris field” around Earth, and in similar locations. Meanwhile, my character at one point went shopping for some new eyes, and on another occasion had a couple tanks of spare oxygen installed inside her body, just in case. The whole solar system is in motion, as it should be: no fixed routes from London to Paris here. If you set out for a nearby station, your journey there is animated in a way that takes into account the lowest-energy way to accomplish that journey, which is anything but a straight line. If you go further afield, you get a brief transition screen telling you how many days you’ve used up (usually measured in the hundreds), and when you arrive the positions of the planets are updated accordingly. Time is not particularly a source of pressure. Age doesn’t seem to be important, and you can always get a new sleeve to inhabit, even if you die (which happened to me several times within my first half hour of play). Resources like fuel and food aren’t simulated, so you don’t have to worry about running out. The very fact that you can casually go on a voyage of a year and a half just to check something out gave me a sense of utter strangeness like that of playing Hoist Sail for the Heliopause and Home. Sun Dogs doesn’t really focus on goal-seeking play. The couple of missions I received at the outset of the game took me only a few minutes to complete and were not followed up with others — and they also had little consequence when completed, as far as I could tell. Meanwhile, just by exploring various locations, I automatically received assorted upgrades to my body and mind, not because I was looking for them or had paid for them but because exploring that area simply brought them into being. The biggest appeal for me was simply drifting from place to place and investigating all the unusual places and events. 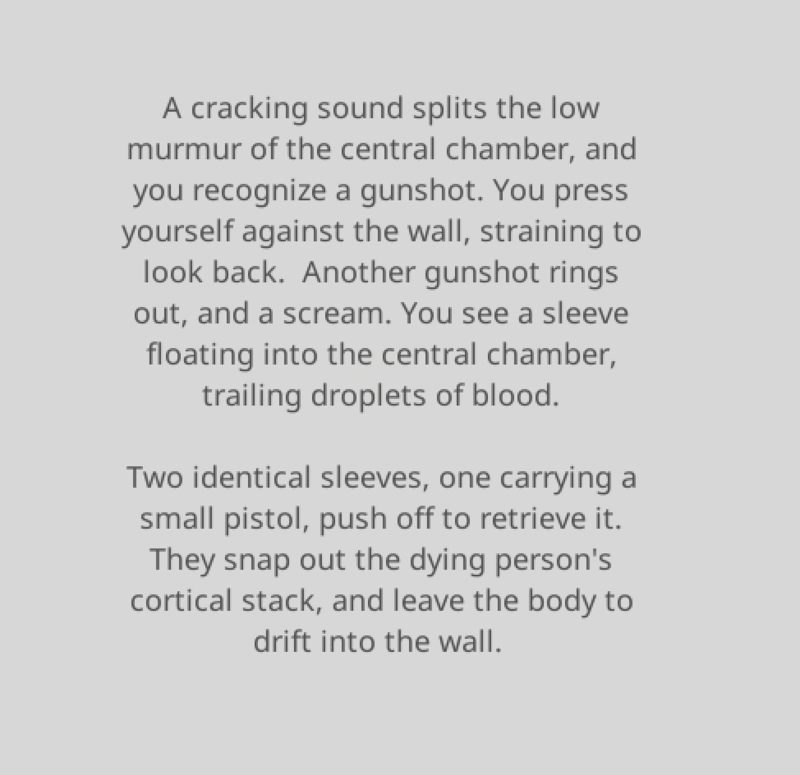 This entry was posted in interactive fiction, Reviews and tagged map, sun dogs by Emily Short. Bookmark the permalink. That and the fact it calls bodies “sleeves” reminds me powerfully of Richard K Morgan’s excellent Takeshi Kovacs novels. Having said that, I am a bit ambivalent about Sun Dogs. I like the setting, but there is a general sense of lack of purpose to the player’s pursuit, not ameliorated by the fact that death feels both random and trivial. I don’t mind being killed often, but it needs to be meaningful (i.e. trying something risky, being on a mission, etc.). Can someone tell me if the game is accessible for screen readers?